Versatile, Fast Scanning, Best Value! The AV1760 is a compact, high-speed color scanner. Designed to scan both documents and plastic ID cards, the AV1760 can be used to capture all the information you need in a fast, and reliable performance. The scanner's straight paper path provides smooth and reliable paper transfer and less document jam. It also ensures thicker paper up to 400 g/m2 and embossed plastic cards up to 1.25mm can be transmitted smoothly. 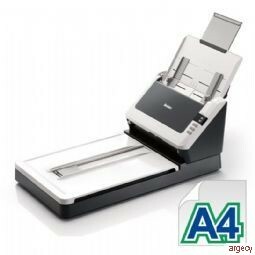 The AV1760 has a 50-page Automatic Document Feeder can scans up to 20 pages per minute or 40 images per minute in duplex mode. It features 600 dpi optical resolution, 48-bit color, USB interface and scans everything from photos to legal sized documents. The AV1760 is a 30 page-per-minute, duplex sheetfed scanner that is fast, reliable, and affordable for business where scanning plastic ID cards, business cards, documents or other heavy card stock is necessary. With the straight paper path, the scanner allows thicker paper up to 400 g/m2 (110 lbs) and embossed plastic cards such as credit cards, or driver's license up to 1.25mm to be transmitted smoothly. Ultrasonic multi-feed detection assures you that not a single page of your documents will be lost. The AV1760 comes with TWAIN and ISIS drivers, and is bundled with a suite of powerful software applications that include Avision Button Manager, AvScan 5.0, and ScanSoft PaperPort 14SE. With Button Manager, you can create searchable PDF, scan and send images to e-mail, printer, or other destinations with just a simple press of a button. The AVScan V5 and ScanSoft PaperPort are highly effective image processing and document management software that helps you streamline your task more efficiently.